This bed used to be a lawn, but the grass would not grow strongly enough, it has a lot of little gems - it is fairly shady and always cool. It can get a bit dry in the summer but lots of compost compensate for this. In January 2007 two very large birch trees were felled from the hedge, so the bed will be moister but also hotter- they were past their best but will be missed none-the-less and we wait to see the impact it will have on the bed. 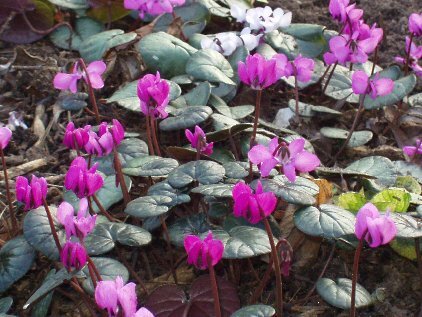 Cyclamen Coum are beautiful from January onwards, these are followed by snowdrops, hellebores, anemones and erythroniums in early spring. 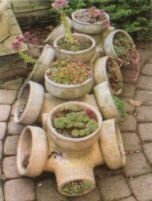 All these disappear gracefully after flowering. Both the Smilacena (in the same family as Soloman's seal) and the Korean lilac are very fragrant - the sort of strong scent that has you smelling everything until you find it! Later there are liriopes one of the few flowers that flower in dry shade in the autumn.